Back in the day, Tim League and his friends watched a lot of horror movies on VHS. From those humble beginnings, League took his love of film and created Austin’s Alamo Drafthouse. He is now looking to expand the organization’s presence nationwide. 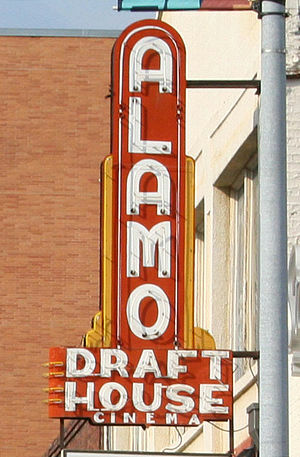 Alamo has created its astounding success by delivering unique compelling movie programming along with themed entertainment. The audiences rave. With Alamo’s Signature Series, for example, programming includes events such as Food & Film nights (with offerings such as a screening of CASABLANCA accompanied by a Moroccan feast); Weird Wednesdays for the best in classic trash; and its Cinema Club that showcases classic films along with discussions led by filmmakers, film historians, and academics. In addition to its emphasis on unique programming, Alamo Drafthouse sponsors a Fantastic Fest film festival, distributes its own Drafthouse Films, and manages its Mondo film art boutique. To see what’s coming up, go to http://drafthouse.com/events/austin. League has also been responsible for some behavior modification, raising a national storm last year when Drafthouse banned texting and talking. When you’re a Home Projectionist, you love to plan programming — from making film choices to selelcting accompanying shorts, cartoons and whatever else might strike your fancy — to create signature at-home viewing events for your family and friends. Alamo Drafthouse can be a model to which Home Projectionists aspire.